Have your needs changed? Complete your Defender security system with this high definition night vision bullet camera. 1080p, weather resistant and easy to install yourself. Keeping watch 24/7. This is what a security camera should be. Compatible with DVRS: HD1T4, HD1T8 & HD2T16. The Swann Ultra HD 4K Day/Night Surveillance dome Camera delivers everything you need to expand your existing Swann 4K NVR security system. Be protected and see every detail with crystal clear, Ultra High Definition. 4K is 4 times clearer than 1080p video. By adding additional cameras, you can take advantage of the extra channels in the NVR and see more of what's happening at your premises. Its easy to get connected. The dome camera comes with a roll of 60 feet Cat 5 Ethernet cable that uses Power over Ethernet (PoE) to transmit video and power to and from the NVR. The dome style camera is IP66 rated for weatherproof use indoors or outdoors and can see further in the dark with infrared night vision up to 100 feet. 1080p Outdoor True Detect Thermal-Sensing Bullet Security Camera - White This security camera features Swann's True Detect PIR Thermal-Sensing technology to reliably detect heat-generating moving objects, such as people, large pets & cars. With more accurate motion detection you have more reliable notifications & recording, eliminating false triggers such as falling leaves, bugs, rain & more, saving you hard drive space & playback time. The sturdy polycarbonate camera construction is weatherproof and can be used both outdoors and indoors plus, with the camera's powerful infrared night vision, see in the dark up to 100ft (30m). The camera comes with a roll of 60ft (18m) BNC cable to connect it to the DVR. 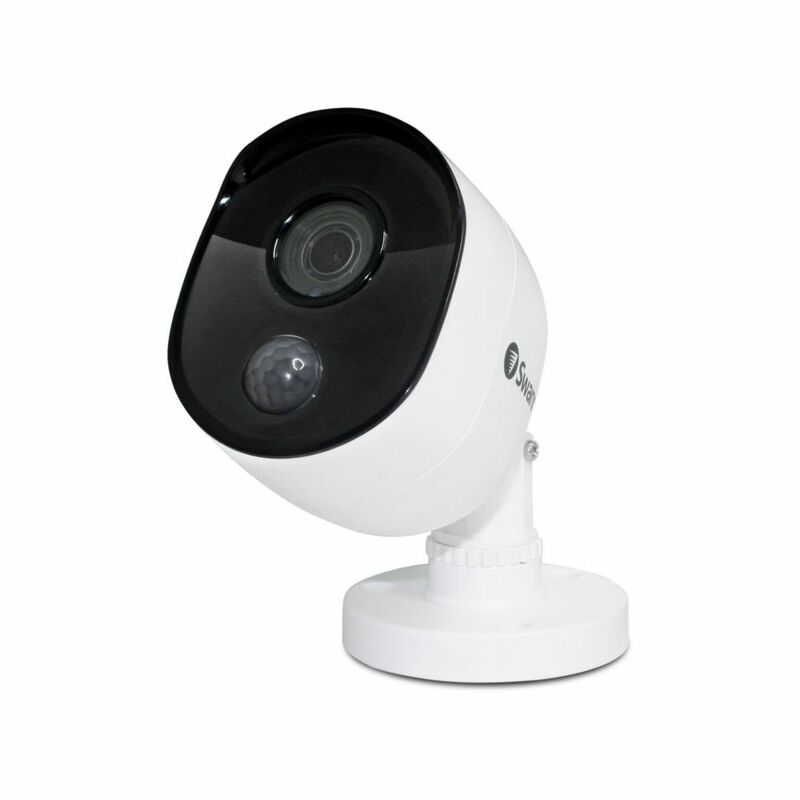 1080p Outdoor True Detect Thermal-Sensing Bullet Security Camera - White is rated 4.1 out of 5 by 8. Rated 3 out of 5 by MrM from This is NOT compatible with all Swann DVRs. This is NOT compatible with all Swann DVRs. Rated 5 out of 5 by Jay from Cameras worked as expected. Much clearer in picture than my previous Swann cameras from a few yea... Cameras worked as expected. Much clearer in picture than my previous Swann cameras from a few years ago. IDK how the camera will fare with it facing east towards the sun which caused my previous camera to fail. But so far I'm satisfied with them. Rated 5 out of 5 by Jakub S. from Best thing on the market This is awesome ! Worth the money and time hooking it up. Rated 4 out of 5 by Greg M. from Camera These cameras are pretty good for the price. You do seem to get some things that looks like bugs flying around at night but for the price I can live with it. Rated 5 out of 5 by Gene K. from Camera Purchase I love the Swann cameras. They were easy to install and position to see my home day and night. It is an added security when I am away from home.